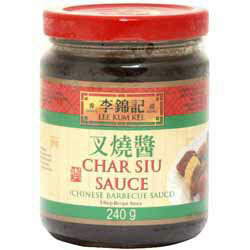 Lee Kum Kee Char Siu Sauce (Chinese Barbeque Sauce) is a thick honey and soybean based oriental barbeque sauce. Its rich tangy but sweet taste adds a new dimension to barbequed, baked and grilled meat, especially chicken wings. It also makes an ideal marinade and is great for stir-fries too. • Heat 2 tbsp oil in a casserole pan. Saute sectioned 4 spring onions, 4 slices of ginger, 6 shallots (skinned and crushed) and 6 Chinese mushrooms (soaked, squeezed and cut into pieces) until fragrant. • Add 450g chicken (cut into pieces) and stir-fry until lightly golden brown. • Add 5 tbsp Char Siu Sauce and 250ml water. Cover and cook over low heat for 15 minutes until the sauce thickens. Serve garnished with shredded red chilli. Ingredients: White Sugar, Water, Salt, Fermented Soy Bean Paste (Water, Salt, Soybean, Wheat), Honey, Soy Sauce (Water, Salt, Soybean, Wheat), Malt Syrup (Rice, Barley Malt), Modified Corn Starch, Spices, Acid E260. "Dear Spices of India, I have ordered from you for UK delivery before and been very satisfied with your service. This time as no one was visiting with their own transport I decided to have a delivery direct to me in France. I placed the order early monday evening and it arrived today (friday) at 11am. The parcel was too heavy for me to carry from the delivery van and needed the sack trucks to get it to the house! an excellent service for an £8 delivery charge. I will certainly recommend you to my friends in the expat community here in France, most of whom are curry fans."